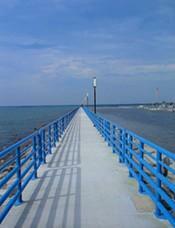 An Alpena vacation getaway is a perfect way to escape the summer heat and stress of the city. The lakeside town in northern Michigan makes an ideal family vacation or weekend escape for two. Located on the shores of Lake Huron's Thunder Bay, Alpena offers a wealth of outdoor activities, all year round. Alpena was first "settled" in the early 1800s as a logging port. Later commercial fishing because the town's chief industry and it remains a large contributor to the local economy today. The region is also known for its limestone quarries. Tourism became popular in the Alpena area beginning in the mid-20th century as city dwellers from Lower Michigan arrived to savor the picturesque bay's fishing, camping, hunting, and boating pleasures. The Lighthouses of Lake Huron -- Five historic lighthouses surround Alpena, including the Old Presque Isle Lighthouse, the tallest lighthouse on Lake Huron. The tower, built in 1870, has 130 steps to the top and intrepid visitors are rewarded with a spectacular view from the top. Lake Huron Shipwrecks - More than 20 shipwrecks, just off the coast of Alpena, invite divers to explore their murky remains. Diving charters with guides are available. National Maritime Sanctuary - This 20,000-square foot facility gives visitors a chance to learn about the more than 200 shipwrecks in and around Alpena. Hundreds of artifacts are on display and there are many interactive exhibits about the maritime history of the Thunder Bay area. Michigan Wineries and Breweries - The area surrounding Alpena is home to several wineries and breweries, including the Fletcher Street Brewing Company and the Stony Acres Winery, right in the city. Both companies offer tastings and tours of the facilities. Outdoor activities in and around Alpena include golfing, boating, fishing, kayaking, hiking, and biking. Winter visitors can enjoy cross-country skiing, ice-fishing, and snowmobiling. Alpena also hosts a number of schedule events during the year, including the Thunder Bay Maritime Festival, held annually over the July 4th holiday. Alpena is located about 125 miles north of Bay City and Saginaw, Michigan and about 200 miles north of Detroit. The drive north of Bay City is one of the country's most scenic and hugs the Lake Huron shoreline. For those wishing to fly into Alpena, the town has a small air field and Northwest Airlines commuter flights connect it to Detroit Metropolitan Airport, and from there to points all over the United States, Canada, and abroad. Alpena is also just 20 miles north of the Hubbard Lake resort area. Accommodations in and around Alpena run the gamut from traditional motels to cabins and cottages to small, independently owned bed and breakfast inns. There are also many private home rentals and over a dozen campgrounds. A car rental is a near necessity on an Alpena vacation getaway as most of the sights, beaches, and restaurants are apart from one another. Besides, you'd hate to miss the spectacular drive down the coast on route 23. Making plans for an Alpena vacation getaway is relatively easy. A travel agent, versed in Michigan travel, can help you make your arrangements, or you can do it yourself with a little help from the Alpena Visitors Bureau. Most campsites and cabin rentals require that you make your reservations well in advance of your arrival. It is common for cabins to require prepayment with that payment non-refundable unless the unit can be re-rented. Traditional hotels allow for a little more flexibility, but they too are often booked well in advance in the middle of the summer.